I stitched two different Just Nan designs this month, they will follow as part of the main post this month. They are Moon Riders Jasper and Nan's Garden bands for a round robin. Once upon a time a young girl who lived in a country where it was always Winter and never Christmas. She was very sad and often lonely so she would wander through the woods building herself friends from the snow which lay all around her. Because it was always Winter the days were short and she knew she must be safe at home by nightfall. The woods were also home to many strange and frightening creatures. living in unusual tumbledown or halfbuilt cottages within the depths of the woods. One day when the young girl was returning from her daily Build-a-Friend expedition she encountered a beautiful shimmering fairy, her Guardian Angel. "I am here to grant you the traditional three wishes. What is your greatest desire, oh lonely young woods girl?" the Angel sang to her. The young girl thought hard. Should she wish for Frosty the Snowman to come alive? Or should she think of herself? Maybe the circus could come to town to entertain her and Frosty? "My first wish is for the key to a beautiful garden full of Summer flowers, where bees Gather Honey"
The Angel waved her wand and granted this wish. "It's a very lovely green garden" the girl said, "but somehow I imagined a few flowers?" So the Angel waved her wand again and a beautiful archway of roses appeared in the garden with beds of fragrant flowers and more bees. The girl knew she would never be hungry for honey again. "And for your final wish?" asked the Angel. The young girl thought hard, "I would really like a special treat"
"It's always Winter in the woods and never Christmas. I would really love to see a complete White Christmas"
The Angel looked at her and said "Come on dearie, I gave you a flower garden amidst the snow but some things need more than fairy magic!" 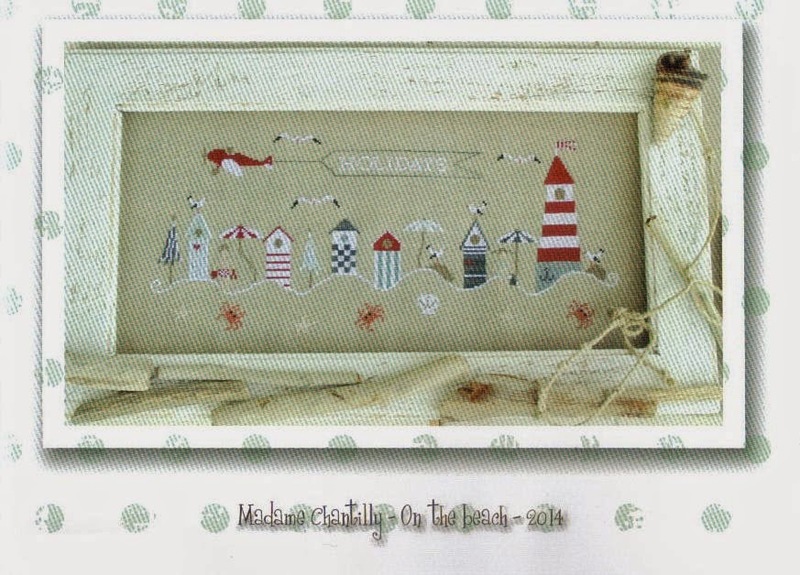 Finally the Summer Postcard Blog Hop is nearly at an end. I am waiting for one more photo promised to me then I will send out the final two postcards. I'm just back from a few days away and was looking forward to sharing my stitching progress with you. It's amazing how much you can get done in the evenings when the internet is not there to distract you! But if it were not for the internet then I would never have "met" Debbie or learned of her passing. Deborah aka SoCal Debbie started following my blog (and vice versa) back at the beginning of 2013 and we exchanged regular comments and emails over the months. As a Brit I had never heard of the abbreviation SoCal for Southern California and read it as "Social" which those of you who know Debbie will agree was a great description for her. Sadly Debbie suffered a sudden heart attack while out walking her dog and despite the best efforts of her neighbours and the medical profession she passed away. I know there will be alot of posts mourning her and I hope she is watching us all and appreciating the sentiments. Debbie was also a contributor to our Hallowe'en Ornie SAL Blog where she will be greatly missed. 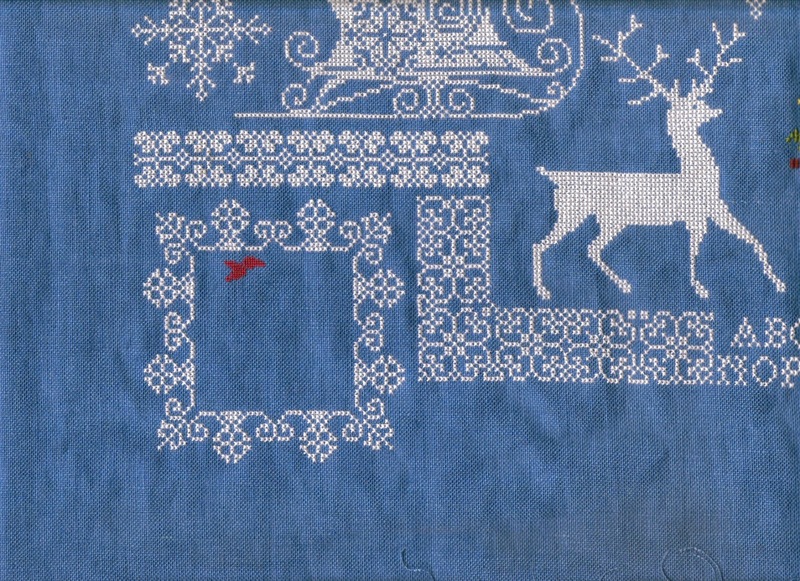 She leaves behind some beautiful stitching as well as some treasured emails. Gosh, here's a serendipitous happening. 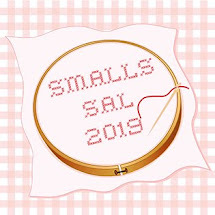 I went to find the last progress picture of the holiday stitching and right underneath is Debbie's name as she chose the Theme-a-licious link for the next month. Pretty impressive? 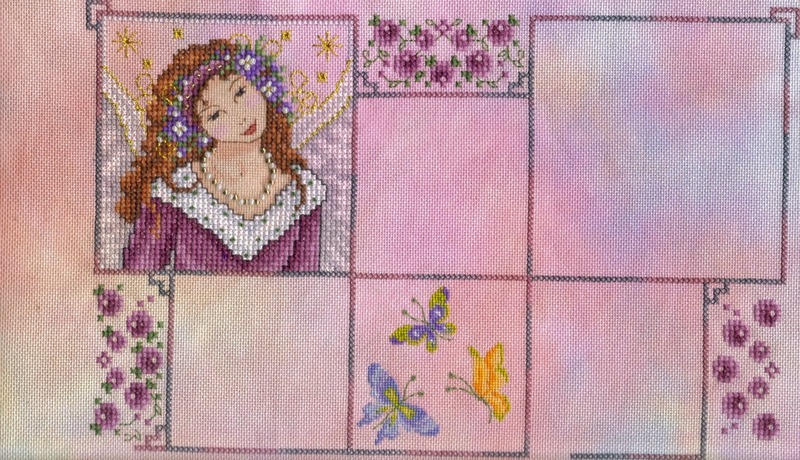 The gaps in the outer border are where flowers overlap the stitching. 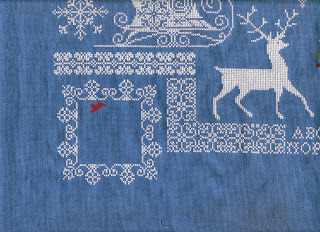 I concentrated on plain border stitching as much as possible to avoid changing colour too often. There is going to be alot of confetti stitching in the flowers in the middle. The symbols on the chart are not the easiest to follow and I haven't made a working copy to colour in (yet). 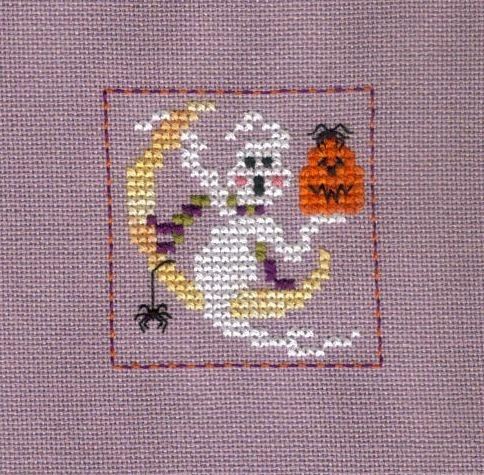 The August theme for the Hallowe'en blog was Ghosts, and as luck would have it the second Moon Rider design by Just Nan featured a ghost! 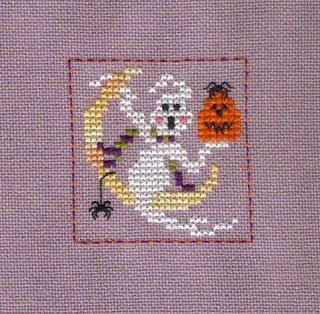 I stitched him using the DMC conversion supplied but changed the moon to DMC 4090 which is a variegated thread. I also used the darker green for his scarf as the light didn't show up. I stitched a stripy border to match the first design. 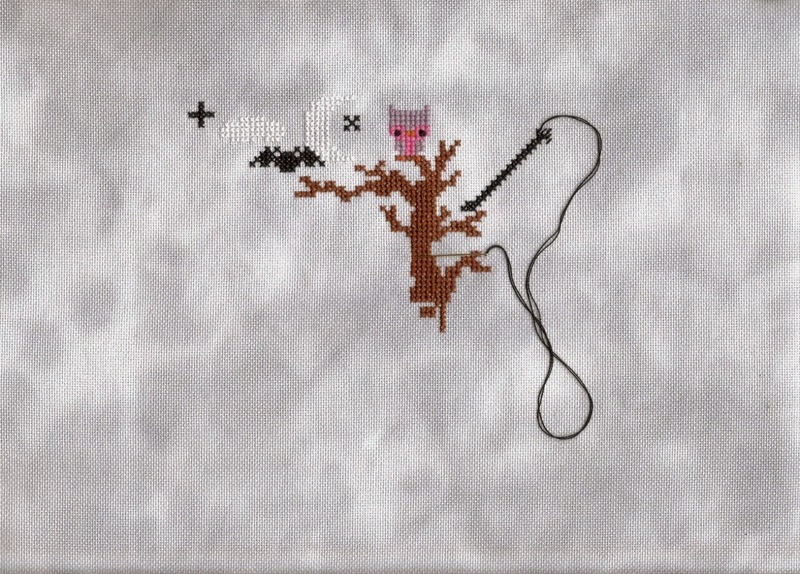 The Little Stitcher design isn't quite finished yet so I will show that one later. 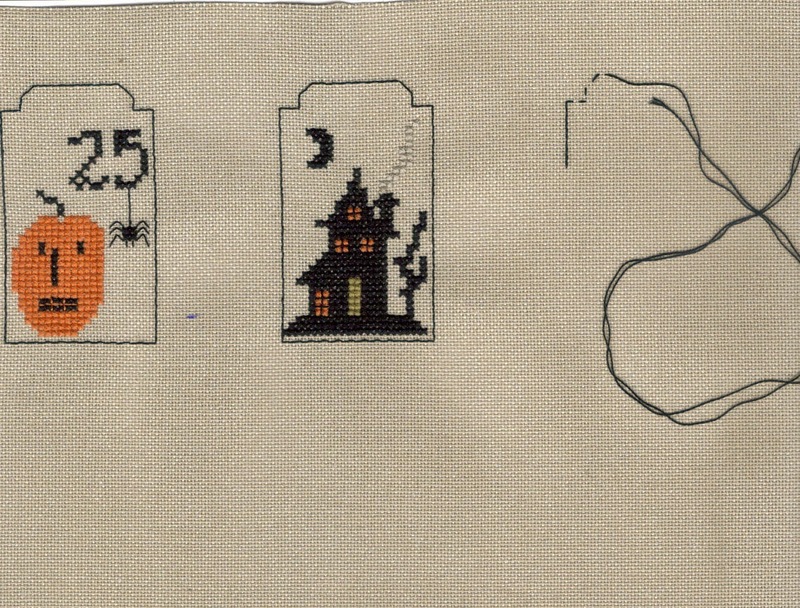 My progress on Primitive Hare's Spooky Countdown has been steady and I now only have two blocks, the header and the footer to stitch with a whole two months to do them in. I haven't quite finished it so no close-up yet! "On this day be daring, doing some little folly that you wouldn't usually permit yourself to do"
I have been pondering this while I stitch. Sometimes it is good to step outside our comfort zone, either in our stitching or in our real life. 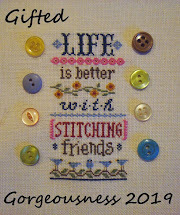 Over the past three years of blogging I have attempted various stitching things I had not tried before thanks to the encouragement of others. Pillow finishes, 3D sculptures, mystery SALs where the finish is unknown. While I was pondering all this and thinking about new challenges for next year I had a bright idea (which I may come to regret!). Why not ask you all for some ideas of follies I could attempt? Leave a comment and while I won't promise to do them all (or indeed any, no bungee-jumps here!) I will give every one of them due consideration LOL. I will stitch baby's name in the banner where it says Holidays. The chart was not available as a PDF so I had to pay postage and as we all know, the rule is Always Maximise Your Postage. So I bought this one for me too! 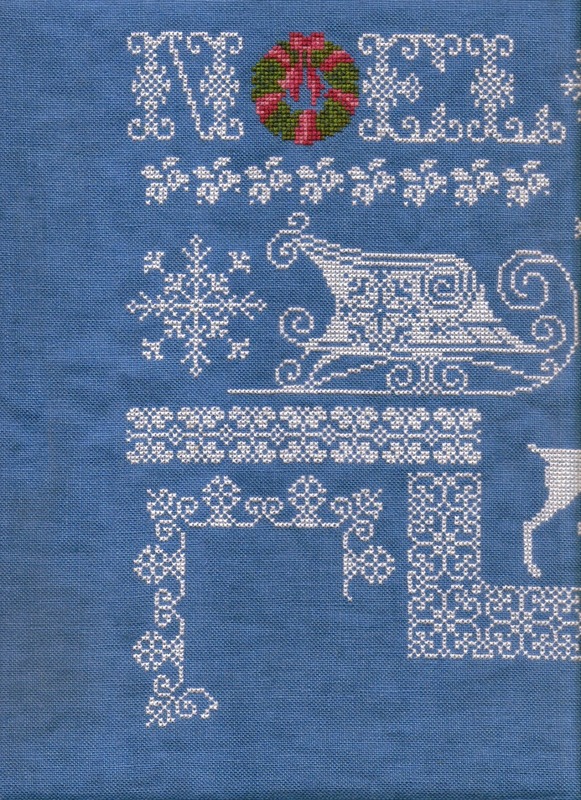 There is also a Christmas one and a Roses one (for Spring), so who knows I may buy those and stitch all four as seasonal pieces. In the envelope there was also a free bunny chart and a cute little owl charm, totally unexpected and very lovely. I would definitely recommend Madame Chantilly. 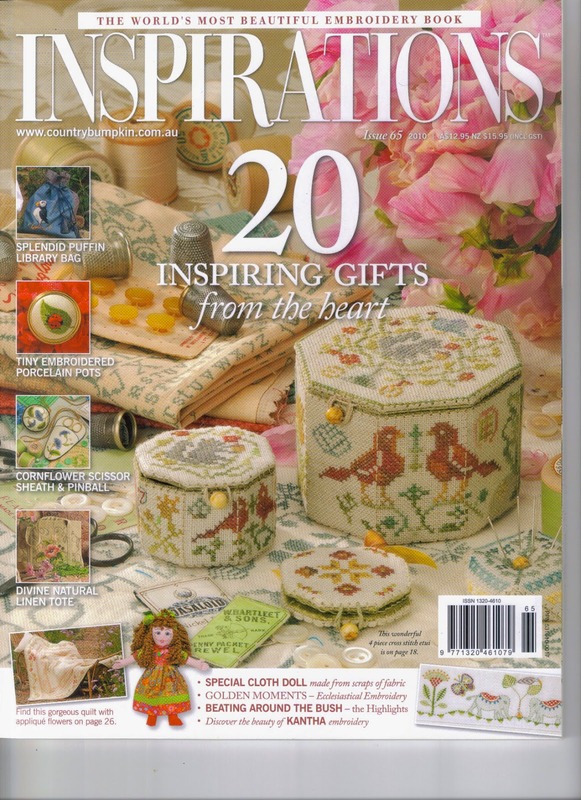 It's a book/big thick magazine/bookazine/callitwhatyouwill and is packed with various different sewing projects. Including this lovely little box with all sorts of things inside it. A real challenge to my finishing skills but the instructions do look clear. Slightly unimaginative title there! But it is what it is. 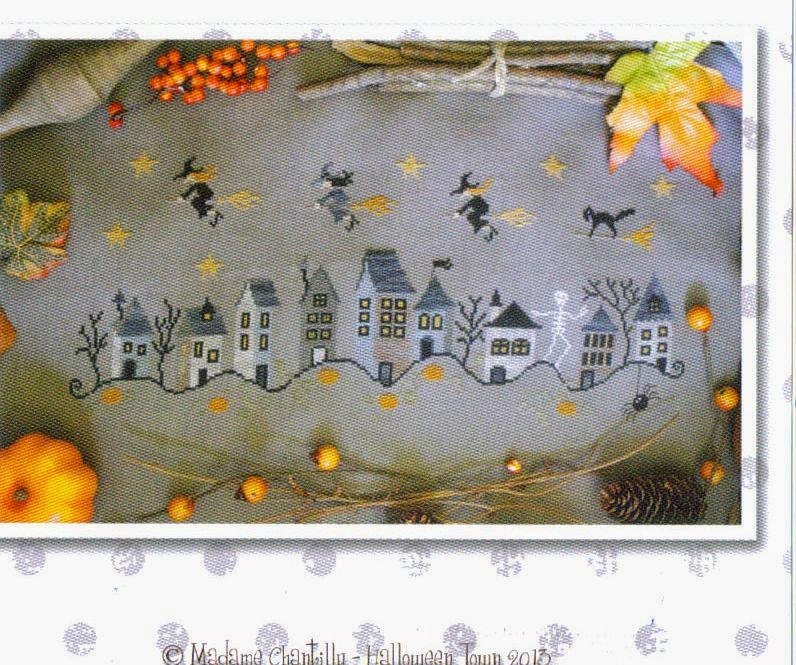 At the beginning of the week I continued with the Frosted Pumpkin Hallowe'en Town Mystery SAL. 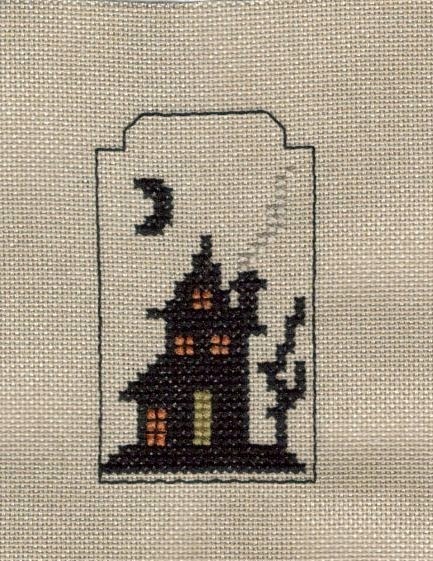 I have been stitching the house. I decided to tweed the main colour which was charted as DMC 503, so I used one strand of 503 and one strand of 501. The effect is really nice. Some people have used a variegated thread for the house but I didn't want a stripy effect for mine. The more I stitch the more I wonder why I didn't order the 32 count? Maybe if I type that sentence enough it will remind me next time I put an order in! The other project has been the Band Sampler Round Robin. We are approaching the end of this RR. 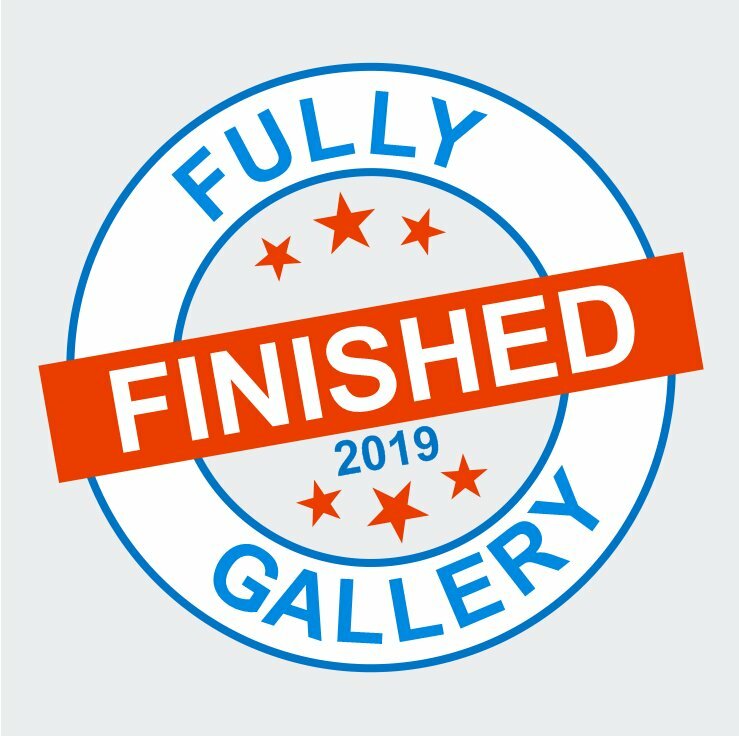 The next piece I get will be Kathy's and as I mail to Kathy it means that it is the last round! But this is Linda's. 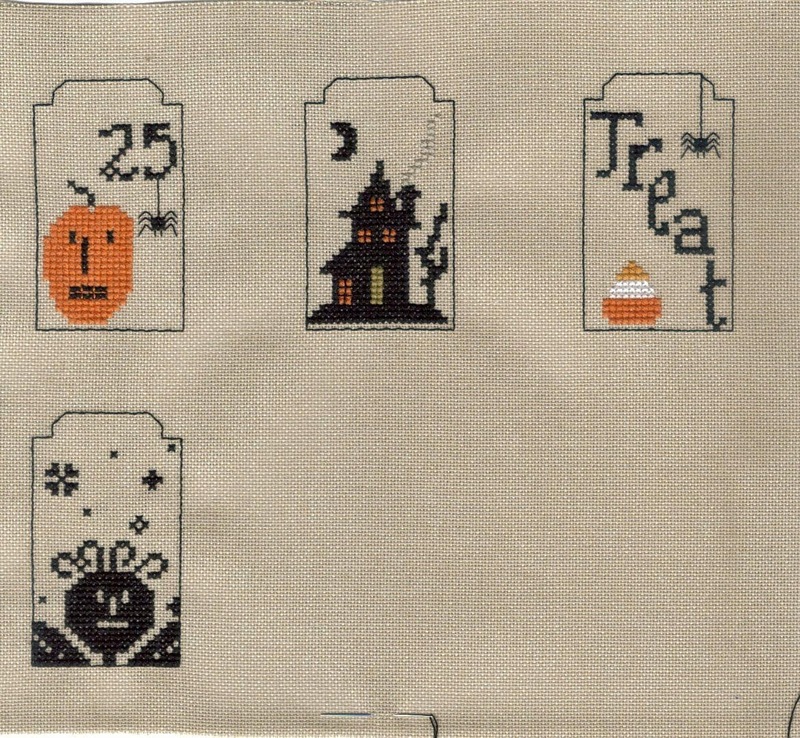 Linda has a free choice sampler so I used a chart from my Just Nan stash. The great thing about these RRs is that I can get my JN fix at the same time as joining in the RR fun. The whole long thing so far! My bands came from Nan's Garden. 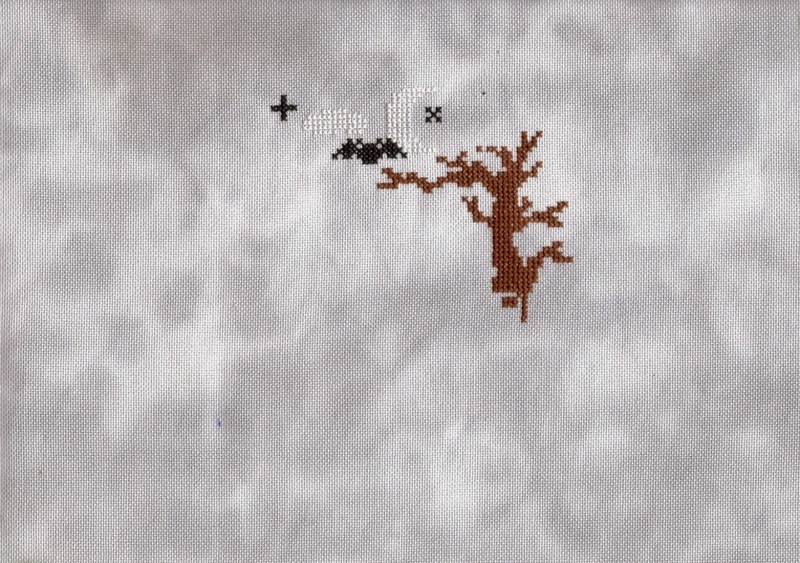 I stitched almost exactly as charted, the colours fitted perfectly. I did change the satin stitched fence to ecru because the white didn't show up too well. It's been rather nice to OAAT for a change. 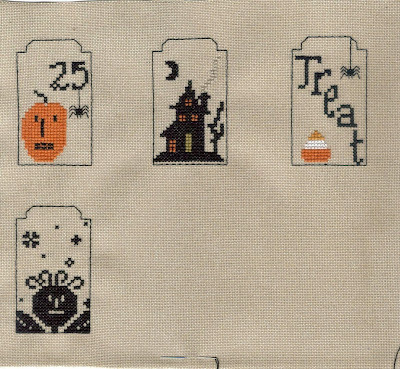 This week I return to my Challenge pieces; the Spooky Countdown, the Hallowe'en SAL and the Little Stitcher 12 Days all have to be completed over the next week. I mentioned a couple of posts back that I had received the JCS magazine CD for the years 1991 to 2000. I am working through the decade and am pleased to say the designs are improving. Sadly the same cannot be said for the hairstyles or dress sense LOL. In 1995 there is a lovely monthly series of mini band samplers with a flower and a gemstone for each month, only about 4 x 2 inches each. I love them! "The Internet is a loosely-organized group of roughly four million people all over the world who communicate through their computers"
"Be careful of others' feelings. Choose words thoughtfully. Rephrase anything that might be misunderstood. Since body language and facial clues are absent from the conversation, use emoticons or acronyms to point out humor or sarcasm. Reread your posts and e-mails before you send them. With most software, once you've pushed "enter," your words are sent; you cannot cancel or edit them." Finally, the Summer Postcard Blog Hop is ongoing throughout August. We have seen some lovely Garden themed stitching and some beautiful garden photos too. Why not check out any you may have missed so far? This is for my cousin's baby girl. 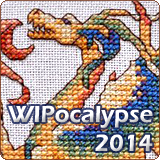 Tell us about your oldest and newest WIPs. There is a lot of metallic thread to stitch as yet. 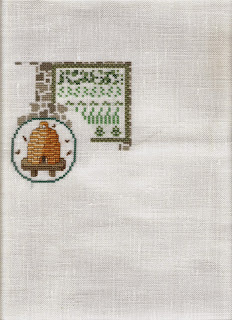 I have decided not to stitch the border. Mum was looking at her and preferred her as a round. She doesn't actually know I'm giving it to her though. I do have older UFOs. 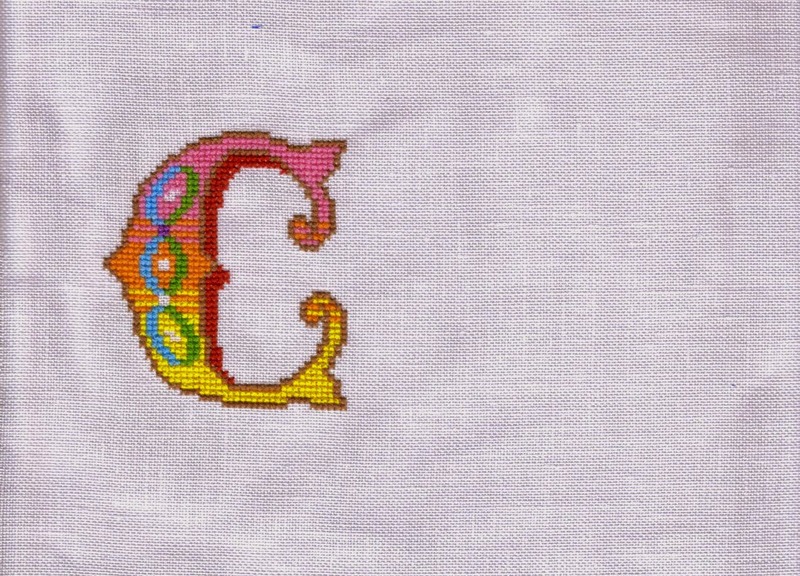 The worst one is a beautiful alphabet stitched using variegated thread on the most hideous hard and scratchy aida imaginable. If it wasn't red variegated then I might be prepared to wash it in an attempt to soften the fabric. How hard is the fabric? Hard enough to cause a friction burn on my wrist last time I attempted to stitch on it! This is a quarter of the design, so I have stitched too much to want to start again on nicer fabric but not enough to see the end in sight. 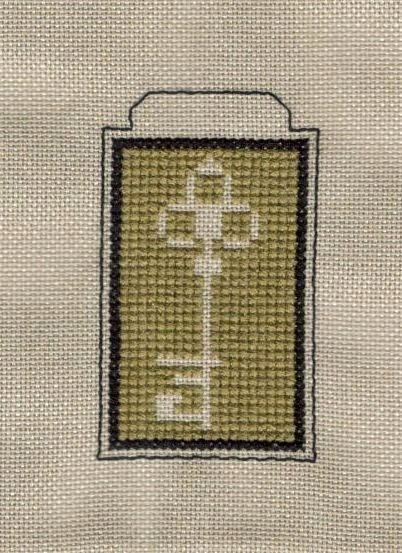 If I had stitched just the alphabet I could stomach finishing that or if I'd just stitched the border I could make a very long thin something! 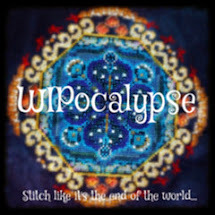 Friday 8th August was designated the first World Cross Stitch Day on Facebook. Now if you play the time zones right you actually get 48 hours of stitching in, starting at midnight New Zealand time and finishing midnight Pacific Ocean time. Over those 48 hours I stitched on two different designs plus my usual bath-time stitching on Noel Blanc. For new followers, that is my son's bath time not mine. I don't think I'd dare stitch in the bath myself! I received a lovely parcel from Crafty Kitten fabrics with all my layaway order. I'd asked for the JCS CD of 1991-2000, the new Hallowe'en ornie issue, the latest 16 DMC to complete my collection and a piece of fabric for the Frosted Pumpkin Hallowe'en Mystery SAL than Sharon Shebafudge signed me up for. I decided upon Moondust in 28 count Jazlyn. I am not sure why I ordered the 28 count instead of 32 Murano? Who knows?! Anyway, I'm making good progress on this using the DMC conversion provided. The tree is finished, now onto the cute little owl. 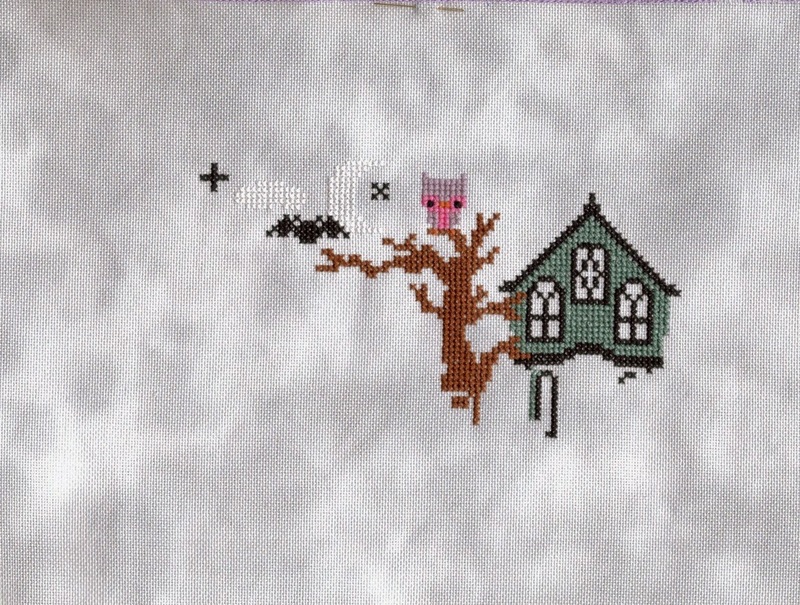 I might have to backstitch the moon and clouds if they don't show up enough. The JCS Hallowe'en ornie issue is as good as ever, I might do a little review later this week for those who haven't got it yet. The CD is hysterical though! I'm upto 1993 so far. What was going on in the US in the early 90s? Did the hairspray affect your brains? LOL. To be fair I don't think we looked any better in the UK fashionwise but our stitching magazines were years ahead! 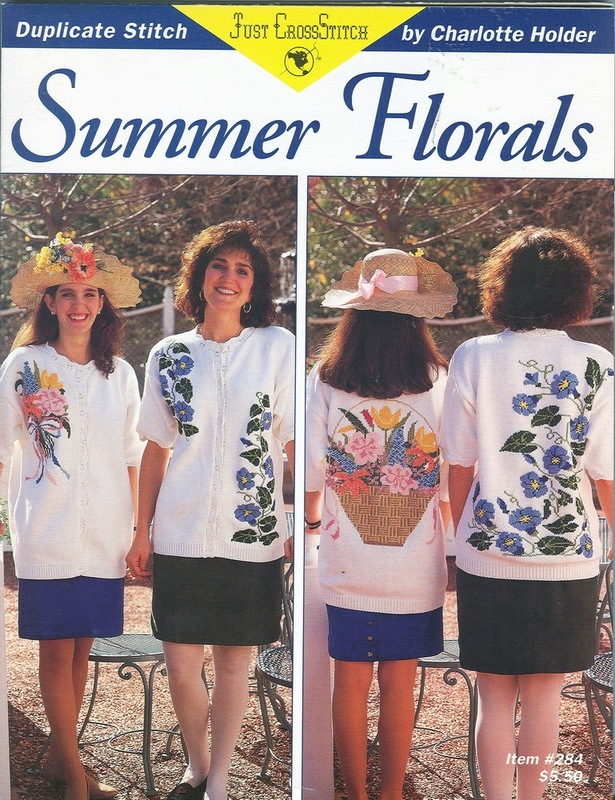 And we most definitely did not wear cross stitched sweaters, what was that all about? The shining exception is Teresa Wentzler. There are full page adverts for her designs which look stunning even now. They must have blown people away when they first appeared. I really love American designers now, you have so many talented people publishing beautiful designs while we seem to be stuck in the "cute and cuddly" rut. I am going to find it interesting as I progress through the 1990s to see these people emerge. These are both part-works so I can't claim a full Happy Dance but they are both steps on the way to one. So that's reason enough to celebrate. 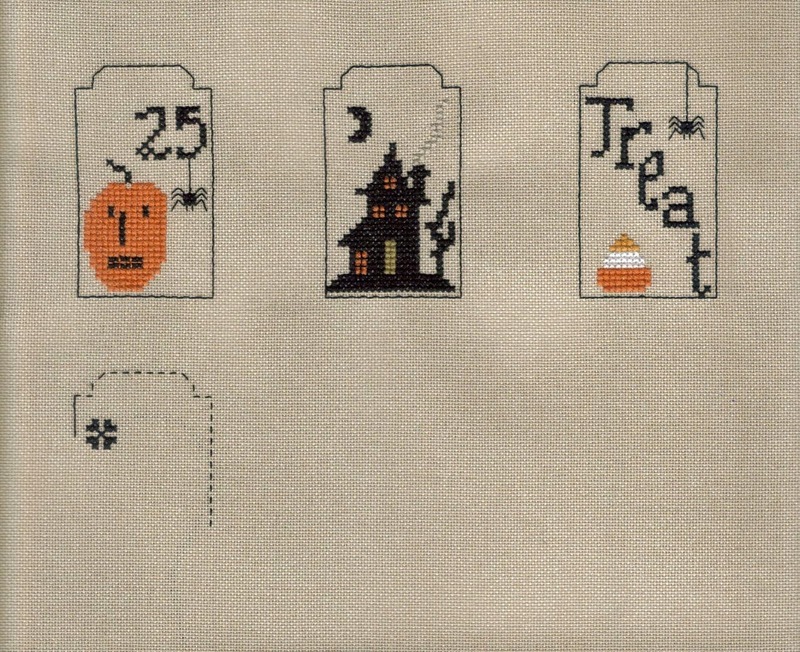 The first project is Spooky Countdown by Primitive Hare. 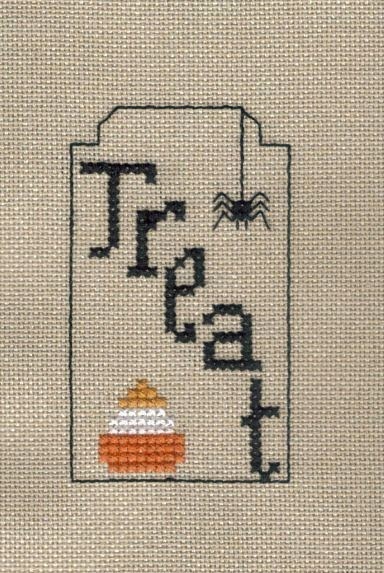 I am stitching one of these per week alongside Giovanna, we will finish in plenty of time for Hallowe'en. Gio is stitching her's as a full sampler, I am stitching mine to mount as tombstone markers for my Hallowe'en Countdown Tree this year. The next project is the Joan Elliott Faces SAL, a FB exclusive. The first month we received the border, the second month the first face. 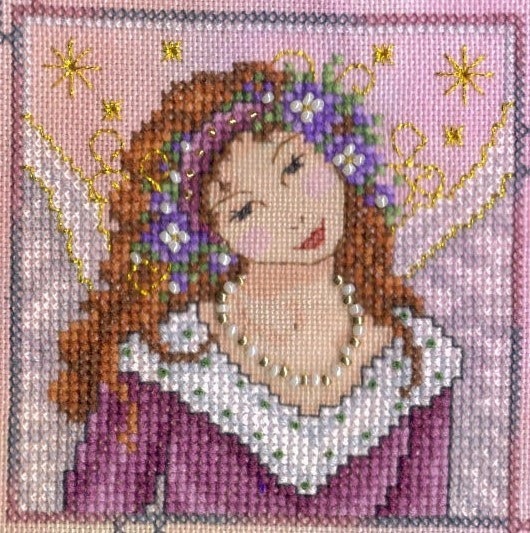 This is an adaptation of an earlier release called Festive Angel, for the SAL she is in purple and called Guardian Angel. It's a lovely friendly group of stitchers, everyone is keen to help and give advice and praise where needed. 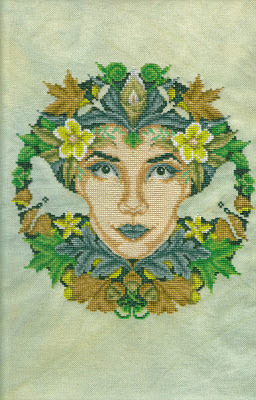 We have the full range of experience from a lady who appears to have never cross-stitched before through the aida-only stitchers to the evenweave newbies right up to those people mad enough to stitch the skin over one! Can you guess where I come? I also changed the hair to a brown version included in the file section. The only other change (apart from recharting the face to smooth the "steps" out) was to stitch her wings with one strand of thread instead of two. I thought they would look a little transluscent that way and fabric would show through. I did beads for the Kreinik french knots in her headband too. 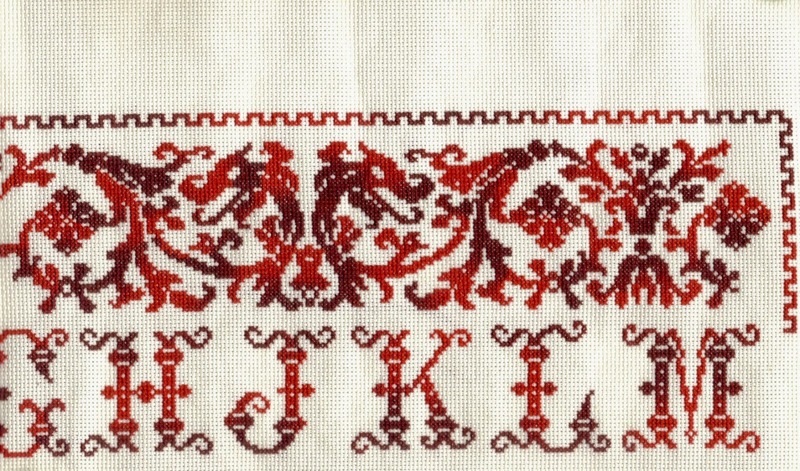 Those are three words which should NOT go together - Kreinik and french knots LOL. 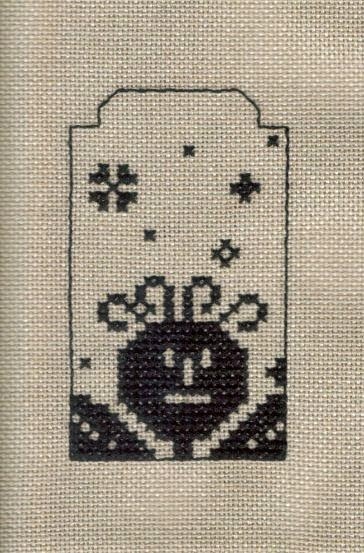 The beads look a little squashed because this is a scan of the piece, not a photo. Finally, I mentioned Giovanna at the start of the post, she lives in Italy as most of you know and loves to attend the shows there. Particularly the Fili Senza Tempo at Formigine. She very kindly offered to send me the charity chart booklet they issue to raise funds for the Childrens Therapy Centre in Modena (the website is in Italian and English). The charts, an Italian alphabet card, a chic notebook, some ribbon from a friend of Gio's and a delightful pillow with my initial on. Close-up of the pillow. Isn't Gio's stitching so neat and perfect? Gio tells me that she smiles because our names are pronounced almost the same although they are spelled so differently. Our middle names are the same too in our own language. Mine is Mary and Gio's is Maria.